In a recent study titled “Winning the Moments Before Your Dealership,” Google outlined five critical moments buyers encounter on their online journey to your dealership. For any marketing strategy, ensuring that you are in front of potential customers is imperative to maximizing its effectiveness. The same goes for video marketing. In video marketing you have to ensure that you don’t fall into the trap of simply creating videos that are ineffective, which nobody will ever watch, or which are irrelevant to what you do. Knowing the type of video, along with the correct message that will attract customers and continue to guide them along the path which ends at your dealership, is what matters and will bring sales. Google’s five critical micro-moments are decision-based and centered on where that buyer is in the car buying funnel. Where should I buy it? Am I getting a deal? Understanding these micro-moments and applying them to broadcast video content so it engages customers, is something every dealership should do — not just for your video marketing, but for every digital marketing channel you participate in. If you can tailor video to those moments you’re much more likely to guide customers down the “yellow brick road” that ends at your dealership, avoiding any encounters with the Wicked Witch (your competition), which could end badly for you (meaning your customer ends up at your competition). For those of you that haven’t yet taken the plunge into video marketing, knowing HOW and WHAT TYPE of video content to produce, along with WHERE to put it, and WHY it’s important, will get you dealership off to a great start. Of course, you won’t know what’s working and what’s not without the data to show you. We’re in an era of data-driven marketing and now have the information to make decisions based on real-time actions — to then take that data and entice and convince customers that, in each micro-moment, your dealership is the one they should choose. And believe me, folks… it works. Consumers today are far more likely to watch a video than they are to read or look at the 40 or more pictures a dealership has on its VDPs, whether that’s a vehicle walk-around, dealership introduction, or a personal branding video message. By simply HAVING video, you are ahead of the game. Through learning and embracing these micro-moments, along with producing relevant videos that are part of a larger video strategy designed to capitalize on these decision-making moments, you’ll be leaps and bounds in front of your competition. Join me at the 22nd Digital Dealer Conference & Exposition on Wednesday, April 12th from 2:30-3:20 pm for my session, “Mastering Google’s Five Critical Micro-Moments with Video – Creating a “Video Marketing Strategy to Maximize the Effectiveness of ALL of Your Video Content and Deliver Measurable ROI through an Increase in Leads, Appointments, Shows and Sales.” I will show you how easy and inexpensive it is to enter the realm of video marketing. You will learn how to create a strategy and how to measure the results through accurate data while being relevant and engaging by incorporating Google’s five critical micro-moments. I look forward to seeing you in Tampa, FL. Should You DIY or Outsource Your Video Marketing? So you’ve decided it’s time to differentiate your dealership from the competition, and that video is the way to do it. Your next probable question is, do you produce, distribute and market the videos yourself, or outsource some, if not all of these functions? The answer to this question is, it depends. We’ve got dealers who are successfully doing both. In my experience there are three factors to consider when making this decision. If your decision to implement video marketing was arrived at rather reluctantly, then you should probably outsource. Motivation requires passion. It requires an understanding of the rewards that will be reaped from putting your time and effort towards this undertaking. It requires buy-in and excitement from your staff. It requires commitment. I’ve talked to many dealers who spend time waffling over whether they should go the DIY video route. Here’s what I ask them: If not you, who? If not now, when? Video is not a trend. Remember the music video, “Video Killed the Radio Star?” The actual song was released nearly two years before the music video debuted on MTV in 1981. Hardly anyone heard of the song, but once the video aired, the song became a huge hit. That was 35 years ago. Online marketing video is here to stay, and it’s just a matter of time before it kills the static Vehicle Details Page (VDP). The second factor to consider is what your internal resources are. Even if you’re highly motivated to launch a video marketing program, someone has to take responsibility. Someone has to take ownership to make sure it’s successful. Someone has to learn how to shoot videos, how to get the videos on the right touch-points and how to measure whether the program is successful or not. The ‘pros’ of producing videos internally are that you already have staff at your disposal. With an established process, inventory videos should take less than 24 hours to upload. In addition to inventory videos, it’s important to create value proposition videos, customer testimonial videos and service videos. Internal employees are in a better position to spontaneously capture a glowing customer testimonial video, and may have a better handle on how to sell your dealership’s unique value proposition than an outside entity. However, when analyzing internal resources, be brutally honest. Are your current employees already struggling to keep up with what’s on their plate? If they are, adding new processes may be too much of a burden. It’s possible to split the responsibilities between internal and external resources. If your in-house staff is currently tasked with taking inventory photos, it’s not much of a stretch to task them instead with shooting a walk around video. Photos can be easily extracted from video, so there is no need to do both. If you use a lot services company to take your photos, task them with shooting a video in addition to taking your photos. If you decide to use internal resources, distribution and marketing are two important areas to be addressed. Who will be tasked with ensuring that your videos appear not just on your website, but distributed to as many touch points as possible; including third-party auto shopping sites and social media channels? Who will be in charge of incorporating video into your digital ad and/or email marketing campaigns? Who will be in charge of collecting viewer data and using that data to increase the relevancy of your videos? Meaning, it’s important to ensure that the right video is shown to the right car shopper at the right time. Another question to ask when evaluating internal resources is what the turnover rate is in your dealership. Are you confident that your Internet Manager or the staff in that department will be with your dealership for a long time? A potential pitfall of producing videos internally is that you’ll have to constantly train new staff. Last but not least, volume is another factor to consider. How many units does your dealership move per month? The greater inventory turnover there is, the greater time investment involved and the greater commitment there must be to the video marketing process. The good news is, a successful video marketing program will increase your overall sales volume, but for some dealers this can present its own challenges. Kia of Puyallup in Washington saw a nine percent uptick in sales after implementing a video marketing program. How many more units can you handle moving per month? Now, is everything as clear as mud? Good! The fact is, only you can decide what’s best for your dealership. It’s easy to get excited about the idea of video marketing and want to do it yourself. But it’s important to be able to objectively analyze your motivation level, internal resources and overall volume. I’ve seen too many instances where dealership salespeople will produce a few videos, upload them to YouTube and don’t see any increase in leads or sales. The dealer points to these paltry efforts and claims that videos don’t work. Well, of course that level of effort doesn’t work! Producing a few videos is nowhere near the same thing as having a comprehensive video marketing program. It’s like deciding that you want to go into space so you build a shuttle in your backyard. Without an actual space program, with testing, logistics, a launch pad and experts to tell you when and where to go, you’re not likely to get very far. Outsourcing some (or all) of your video process may involve investing a little more in your merchandising budget than you currently spend, but the end results will be well worth the investment. No matter which direction you choose to go, the important thing is that you start now — Not next week or even tomorrow. You can start slowly if you need to, but you must start in order to find the process that works best for you and your dealership. The end will justify the means. Social media is a great place for brands to get their message out to the masses using video. Not only are more people watching video on Facebook, but the platform itself is also giving it extended reach in order to entice marketers to publish more video on Facebook. Another really great (for marketers) feature of video on Facebook is that it autoplays in a user’s newsfeed. The problem is that it autoplays with no sound, so a user actually needs to engage with the video in order to hear it. If the user is scrolling through their newsfeed, you literally have seconds to capture their attention. So, how do you maximize the effectiveness of your Facebook videos knowing that users aren’t going to hear it, but only see it? A recent article in Inc., shared that at the Salesforce Connections conference held in June, Facebook’s CMO Gary Briggs revealed a new trend that brands are beginning to use in their video marketing efforts on Facebook. Knowing that they’re pretty much at the mercy of a user when a video is presented in their newsfeed, marketers have started introducing text into the first 5-10 seconds of the video, so as to pique the interest of users and bypass the need for audio to capture attention. Similar to subtitles, this text is actually rendered into the actual video itself, allowing companies to use creative text in unison with their video to capture the user’s attention and get them to engage. Facebook video marketing can be highly effective for dealerships, especially if it’s targeted properly. Video ads are one of the most effective means of advertising on the platform. The ability for dealerships to utilize various data sources and identify in-market car shoppers within their geographical area offers amazing opportunity. Consider incorporating video into your social media marketing on Facebook and, if it’s in the budget, utilize the precise targeting features that Facebook offers. The most effective form of video marketing on Facebook for car dealerships would be more in the area of company branding, fun and random entertainment videos, customer testimonial videos, and occasional inventory walkaround videos. Of course, you should have an entire Inventory Videos page available from your Facebook Menu, making it easy for anyone visiting your Facebook Page to quickly see videos of your inventory (since you actually do sell cars).And, if you have a very rare or unique vehicle, and target it properly, a video ad for that vehicle on your wall could also help the vehicle sell faster as well. However, for the most part, the ability to expose your dealership to potential new customers through well thought out, creative and engaging video can keep you top of mind. A successful video marketing strategy will ensure that your dealership is present at each and every touchpoint that a consumer could visit on their car-buying journey. It will also take advantage of any unique features of the platform to optimize the chances that consumers engage with the video. This super nifty trick will allow you to relay a quick message (a hook, if you will) to consumers without them having to engage with your video, and could make them stop and listen to what you have to say. Last year, Facebook changed its algorithm to favor video content in an effort to gain market share in the very popular video content market. In fact, it’s done such a good job that daily video views increased by 400 percent – a huge rise over its September, 2014 numbers of 1 billion per day, to an incredible 4 billion per day. That’s a significant rise in less than a year. Now, as a further enhancement, at the end of June, 2015, Facebook announced that it is again making tweaks to its algorithm so as to better identify the types of video content its users want. In the past, Facebook’s algorithm tracked the types of content that each individual user liked, and subsequently delivered more of that type of content. For example, users that interacted with photo content the most would be delivered more photo content. And the same for video. However, it always necessitated action on the part of the user. Whether that action materialized as a like, share or comment, Facebook’s algorithm noted that and factored that into the content type it delivered to that person. This comes on the heels of another significant algorithm change that was also made in June, 2015, whereby Facebook started to track how long a user lingered on a video in their Newsfeed. 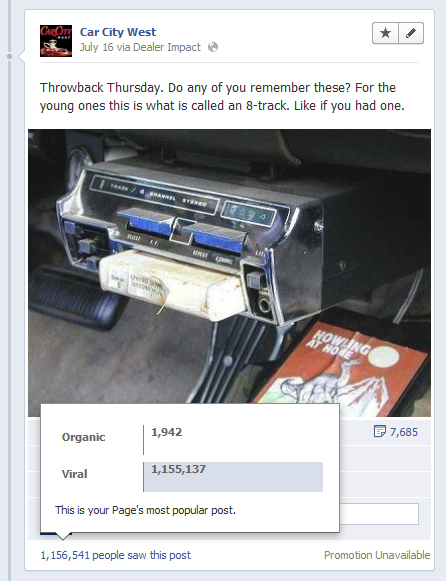 Facebook began using this as an indicator of relevance to that user and factored this in as an indication of interest. From a video marketing perspective, this algorithm now enables auto dealers to see increased reach for their videos from consumers that watched them, but took no further action. Chances are, if a consumer is watching your video on Facebook – whether they are interacting with it or not – they are pretty low down the funnel. Facebook’s new algorithm will take note that they lingered on your video, interpret that as interest, and increase the priority as far as delivering similar content to that user. Facebook knows that its popularity hinges on finding the right balance between satisfying its advertisers and delivering the types of content its users want to see. By continuing to tweak its algorithm, Facebook can more successfully deliver interesting and relevant content to individual users, providing a better overall customer experience and increased opportunities for video marketers to reach relevant consumers. In 1991, a 5’2” 125-pound cowboy stared into the face of Wolfman Skoal. a young 2,000-pound bull with a bad reputation. So bad, in fact, that a $500 bounty existed for any rider that could tame the beast and ride a full 8 seconds. Wade Leslie accepted the challenge. As he mounted the bull in preparation for his ride, the bull promptly lay down in the pen. He considered getting off. But then the bull’s owner reassured him that Wolfman Skoal would perform. Sure enough, once the gates opened, the bull leapt straight into the air like a rocket and preceded to do its best to eject Wade. Wade had different plans, however. He not only succeeded in riding Wolfman Skoal for the full 8 seconds, but also became the first, and to date, only bull rider to score a perfect 100 points in the Professional Rodeo Cowboys Association. Not unlike bull riding, marketers are constantly creating content that is competing with both their competitors and the platform on which that content is published. Right now, the biggest and baddest bull around is Facebook. One could say that as Facebook grows up, its personality continually changes, forcing marketers to continuously change with them. As it finally enters its teens, this 10-year old has decided that, at the moment, it happens to like video content. In bull riding, judges calculate a score for both the rider and the bull. Riders know that their score depends on both how they ride and how their bull performs. A rider can stay on a bull for the full 8 seconds. But if the bull isn’t rowdy enough to impress the judges, the rider can still receive a sub-par score. Keep this in mind when developing your content. In marketing, the success of your content starts with the content creator (the rider) and is dependent on Facebook (the bull). In early summer of 2014, Facebook began releasing in-depth data on video performance. Social media resource Socialbakers eagerly dove into that data in an effort to tame the bull and finally give marketers information that would assist them in their quest for video marketing success. Through the study of 1,000 Facebook pages containing over 3,000 videos, it was found that videos of ~21 seconds long were the most successful. The main metric used to determine a video’s success was its completion rate (i.e. : the percentage of people who watched at least 95% of a video). As in most rules, there are exceptions, yet the in-depth study showed that the longer a video was, the lower the completion rate. Keep in mind that these statistics are based on a preliminary study of Facebook video content in general. We’ve found that the money spot for completion rates on videos are between 1-1/2 to 2 minutes long across all other video platforms. The reason for this is that product videos tend to be sought out by a consumer rather than being delivered to them by the platform. We expect that this will remain consistent, as consumers who visit a dealership’s Facebook page to view an inventory video have purposely sought out this content. Consumers looking to purchase a vehicle are willing to make a longer time investment for the simple reason that it is directly tied to a significant expense. Mobile users are statistically willing to make even longer commitments ranging from 2-1/2 to 4 minutes depending on the device. Any type of content produced by a business has a limited amount of time to capture a person’s attention. Video content has an advantage in that it is the only content that tells a viewer exactly how much of a time commitment they have to by displaying its total viewing length. And if your content is engaging, consumers will give you more of their time. If not, you’ll find them abandoning your message quicker than a bull can throw a rider. The next time you create video content and stare the bull named Facebook in the eye as you prepare to either submit or be submitted, keep in mind the following: high quality, engaging video content that quickly captures a viewer’s attention will increase the length of time that you’re able to stay on the bull and impress the judges. And just like bull riding, they are the only people that matter. How to know when it’s time to leave the past behind? There have been many skeptics in the automotive industry of the benefits of using Facebook or any social media for that matter. The numbers show there are over 950 MILLION monthly Facebook users and 100 BILLION connections, and that’s just Facebook. Pinterest is driving more traffic to retailers than LinkedIn, Google+ and YouTube combined with over 18 million unique visitors. What does this mean for dealerships? Those posting on Facebook and other Social Medias are more likely to make a connection with a potential client/customer leading to the ultimate goal of a sale! People of all ages are using social media now days. Typically the younger demographic are not the ones leading the mass numbers of people on social media. Those in their mid-40’s and up are the largest demographic of social media users. These people are more likely to have spending money and be financed than that of those fresh out of college or younger. Taking advantage of marketing on social media can be quite cost effective and as a bonus, you can track social media marketing. Compared to traditional forms of marketing such as TV commercials or Newspaper ads there is no way to track it. Unless the exceedingly rare customer walks in to your showroom and stats he/she saw your commercial or ad they are almost untraceable. A recent client of ours is experiencing the benefits of proper social media marketing. As you can (picture to the left) see they have gone completely viral. They currently have over 1 million viral connections and 1,900 organic. That number is still growing! One simple post and they have created a ton of exposure. There are a handful of ways to create exposure on Facebook and other Social Medias including Promotions, Ads and Inventory Management. Are you using any of these techniques? If so, what ones and what kind of exposure have you seen? We want to know what works for you! If you would like more information about how to increase your social media marketing benefits please contact us. Posted in facebook, marketing, viral on August 1, 2012 by flickfusion. Posted in facebook, facebook pages, social media, social networking on February 29, 2012 by flickfusion.